Yes, I am behind on some posts! And one event that I have been dying to tell you about was my brothers wedding. Ben married the sweetest girl ever, Ashley. We just love her, she is such a gem. So, of course then, the wedding was so fun as we happily welcomed another sister to our family! The extra fun part too, was so many people who came from out of town. 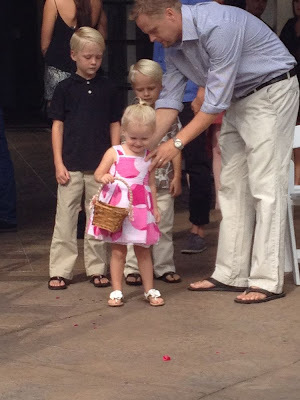 My sister and her family came from Virginia, and all three of her kids were in the wedding, which was too stinkin’ cute. My aunt and cousins came all the way from Michigan, and it was so fun to re-connect with Lee-Lee, Molly, and Jason. They are a hoot! And of course with any wedding, are all the pre-wedding activities. It was really nice to be home for all of that, and simply be a part of their big day. Brandon of course made the trip from Haiti, and so my heart was overflowing to have so many loved ones around and together!! My aunt LeeLee and my mom. Don’t they look so much alike?? We hung out at the hotel where they all stayed, and lounged by the pool enjoy the view of the ocean. Uncle Brandon decided he was going to sit in the fountain and Kate wanted to join him! So she climbed on in!! But she wasn’t too sure about it, thinking she must be doing something wrong! Hilarious! Molly & Jason-they are so cute! Cousin Andrew came from Virginia too. Molly and Brandon-both super funny and sarcastic, which means they are a deadly combination together! ha! Aunt Lee Lee and my brother Ben at breakfast together. At the rehearsal dinner-lots of bribery got that two and half year old down the isle! But she was such a charmer, smiling and grinning the whole time!! My mom did such a great job for the rehearsal-it was at this yummy Mexican place in Fallbrook. She decorated everything so cute, and for dessert had a candy table. My nephews loved it, they hung out by the candy all night, as we enjoyed the privilege of being aunt and uncle and fed them candy all night long! The beautiful bride and groom, Ben and Ashley!! My uncle John took some great photos, so here is one of some of the family. Dancing the night away, enjoying every moment! Isn’t that husband of mine so handsome?? 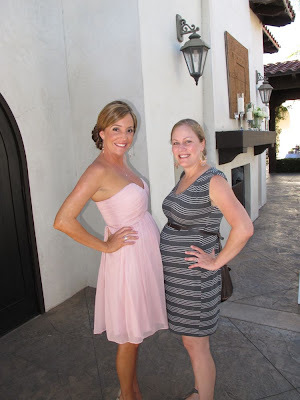 My cousin Elizabeth is only a month or so ahead of me-she is having a boy! It’s so fun to be pregnant with her, we grew up hanging out all the time as kids! They had sparklers for the big send off-so fun! A little scary too though, with the crazy teenager next to me waving his fire stick too close to my very flammable hair!! Okay, here it is. I snuck one in there, so you can see my ever growing belly. This was a month ago, and believe it or not she’s a lot bigger by now! What a beautiful wedding it was! Praying for your transition to Nicaragua! Happy Thanksgiving! We love you! What a beautiful family! Thanks for sharing these photos. The bride’s dress was gorgeous & the wedding looked great! Your family seems so creative & friendly & just wonderful. And YOU are such a cute mommy! I love it! My dear little Jessica, what a beauty you are. 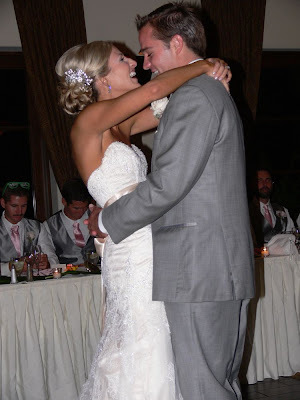 I loved seeing all of the pictures from Ben and Ashley’s wedding and the pictures of you and Brandon’s family. Sure makes me wish I could have been there to meet all of you friends and extended family. We will be praying for you as you adjust to life in Nicaragua and make new friends. Love, aunt Paula and uncle Ron. I’m just thankful you didn’t post any of us at the pool…for a number of reasons!! Haha … love the pics Jessy!! Loving and thinking of you and my dear sweet sarcastic dry Brandon!!!!!! Previous Previous post: On to Nicaragua …!! !